En realidad hay varias formas de utilizar esa verificación en español: ¿verdad?, ¿no?, ¿no es así?, ¿no crees? 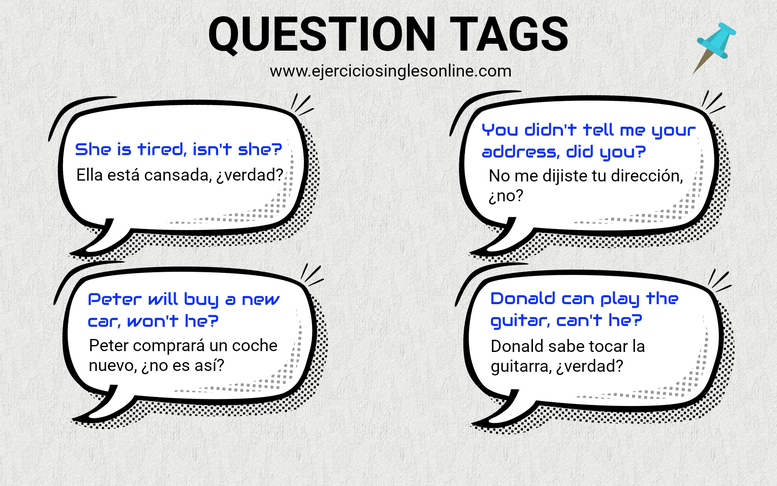 ¿Como utilizar "question tags" en inglés? She is tired, isn't she? They aren't happy, are they? They love pop music, don't they? He doesn't like vegetables, does he? There are 30 people in this classroom, aren't there? This is Sarah's new car, isn't it? These are difficult times, aren't they? They were sad yesterday, weren't they? She was at Paul's house, wasn't she? They weren't really happy last week, were they? Peter wasn't very comfortablet at Tom's house, was he? They played tennis last Friday, didn't they? You didn't tell me your address, did you? Peter won't study at university, will he? Peter will buy a new car, won't he? Alice will visit her grandparents, won't she? Alice won't forget you, will she? Donald can play the guitar, can't he? Donald can't swim very well, can he? He could speak when he was two, couldn't he? He couldn't walk when he was two, could he? You must study harder to pass, mustn't you? You musn't make noise here, must you? You should visit your parents, shouldn't you? You shoudn't speak to me so slowly, should you?